"Soldiers: You are about to engage in an enterprise which, to ensure success, imperatively demands at your hands coolness, decision, and bravery; implicit obedience to orders without question or cavil, and the strictest order and sobriety on the march and in bivouac. The destination and extent of this expedition had better be kept to myself than known to you. Suffice it to say, that with the hearty co-operation of officers and men I have not a doubt of its success-a success which will reflect credit in the highest degree upon your arms." Thus proclaimed General Robert E. Lee's cavalry commander, General James Ewell Brown (Jeb) Stuart. Following the September 17, 1862, Battle of Antietam, Lee's troops had withdrawn across the Potomac River into Virginia to rest and replenish their supplies. Across the river, deployed in Maryland from Williamsport eastward almost to the Monocacy River, lay General George B. McClellan's Army of the Potomac. Lee was understandably nervous about his opponent's intentions. When and where would the larger Yankee army cross the river and attack his own troops? Map of J. E. B. Stuart's raid through Pennsylvania in October, 1862. .
To delay McClellan and gain information about his army, Lee and Stuart hatched a bold plan. With 1,800 of his best men, Stuart would cross the Potomac west of the Yankees– McClellan was using Hagerstown, Maryland, as his supply base– and circle around behind them into Pennsylvania. 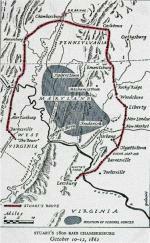 Lee knew that the Cumberland Valley Railroad connected Hagerstown with points farther north; along this rail line came much of McClellan's supplies. If Stuart could burn the railroad bridge over Conococheague Creek at Scotland, five miles north of Chambersburg, the flow of supplies might be disrupted long enough to delay a Union advance in the coming weeks. Lee also authorized Stuart to seize horses to supply the army and take as prisoners any local officials he might encounter to use as hostages to exchange for Southern civilians languishing in Northern prisons. Stuart's column splashed across the Potomac at McCoy's Ford on the foggy morning of October 10, scattering the Union pickets on the opposite shore. Alerted that enemy horsemen had crossed into Maryland, McClellan issued orders for troops to close in on the Rebels. No one, however, knew which way they would go. Troops guarding Hagerstown went on alert to ensure that the supply depot there would not be vulnerable. Other units deployed to watch all the fords across the Potomac. Instead of raiding the Yankee supply depot, Stuart's men rode rapidly northward, crossing the Mason-Dixon Line into Pennsylvania. Once across the border, one-third of Stuart's men fanned out to seize every healthy horse that they could find. By noon, Stuart's men were in Mercersburg, where "terror stricken and paralyzed" citizens feared Rebel barbarities. Assuring civilians that they would not be harmed, the Confederates emptied stores of boots and shoes and took a few hostages before they moved on. In St. Thomas, Stuart's men encountered some local militiamen, but the armed citizens fled after firing a few shots. Two men rode directly to Chambersburg, where they warned the city of the oncoming Rebels. Most locals found their story hard to believe, but local stores did shut their doors, a banker hid the cash, and a local militia company formed to greet the invaders, just in case they should show up. That same evening, as rain shrouded the fading light, Stuart's troopers arrived on a hill west of Chambersburg. After setting up his four cannon, Stuart dispatched a detail with a white flag into the city to demand its surrender. Even as three townsmen went out to meet the enemy, the militia disbanded, well aware of the odds against them. Stuart's men departed Chambersburg early on October 11. The rearguard set fire to the railroad depot, several warehouses stuffed with military goods, some machine shops, and several trains of railroad cars sitting on sidings. A huge plume of smoke rose over the city as the Rebels rode off to the east toward Gettysburg. Knowing the enemy would now know where he was, Stuart turned south at Cashtown, managed to evade pursuing Yankee troops, and crossed the Potomac at White's Ford on October 12. The three-day Confederate raid, heralded in Harper's Weekly as " one of the most surprising feats of the war," was a huge success. At the cost of only a few men wounded, Stuart brought back close to 1,200 horses and a handful of hostages, destroyed military stores worth $250,000 at Chambersburg, and scared the local populace of south-central Pennsylvania. For weeks afterward, Chambersburg store clerk Jacob Hoke later recalled, a kind of "raider paranoia" hung over the city, as skittish residents were unnerved by every false report of more enemy horsemen. 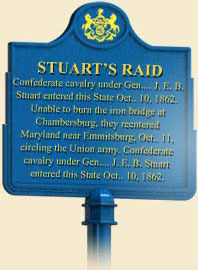 Stuart's 1862 raid would not be the last time Pennsylvania faced an invasion. The great Confederate invasion in June 1863 would make the brief October 1862 foray seem inconsequential by comparison, and a Confederate raid in July 1864 would leave the town in ruins. Greater Chambersburg Chamber of Commerce, Southern Revenge! Civil War History of Chambersburg, Pennsylvania (Shippensburg, Pa: White Mane Publishing Company), 1989. Henry B. McClellan, The Campaigns of Stuart's Cavalry (Edison, N.J: Blue and Grey Press), 1993. Channing Price, "Stuart's Chambersburg Raid: An Eyewitness Account," Civil War Times Illustrated (January 1966): 8-15, 42-44. John W. Thompson, Horses, Hostages, and Apple Cider: J. E. B. Stuart's 1862 Pennsylvania Raid (Mercersburg: Mercersburg Printing), 2002.